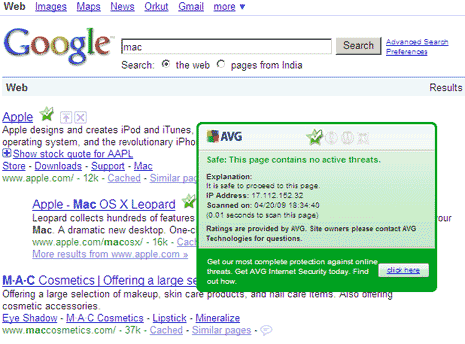 AVG is known for its quality products that offer protection against virus, spyware and other malicious stuff. Traditionally, LinkScanner software comes bundled with AVG Anti-virus Suite. AVG is now offering free standalone link scanner software for Window users using different security software for virus and spyware protection. It is ideal for computer users connected to internet for a long time. LinkScanner show status of links as: safe. malicious and suspicious. This is indicated by an icon at top-right part of displayed links. You can hover mouse over icon next to any link for its status as safe or malicious. Green checkmark is shown next to safe links and red cross sign for non-safe links. Download AVG free LinkScanner and bring more security to web browsing as you search for specific stuff on Google, Yahoo and MSN. Hide any Folder in Windows XP with Ease!